Nakivo keeps updating its flagship product very often. They just released a new beta of Nakivo Backup and Replication 8.5 which brings some significant improvements and new features, such as Nutanix AHV support or Windows Server 2019 support. With Nakivo you can protect Hyper-V, VMware or Nutanix AHV VMs as well as AWS EC2 instances. We have reported in details on the 8.1 release of Nakivo where we highlighted the new possibility to use Policy-based data protection allows you to create backup, replication and copy jobs grace to a policy which automates the jobs creation. The company just announced that their product is capable to replicate production VMs from Backup files instead of replicating from running VMs. This process is not more efficient, or faster, but reduces pressure on a storage array due to snapshots which are triggered every time a replication job starts. Replication from a backup file takes this possible pressure away and reduces an overhead due to snapshots. Another interesting feature from Nakivo is the fact that they just introduced a possibility to install Nakivo Backup on Raspberry PI so you get a very small footprint device capable of protecting a whole environment with a fraction of the cost. We all remember the recent announce from VMworld 2018 that VMware has a working variant of ESXi that will run on ARM processors, so why not a backup appliance? Another interesting possibility is to install Nakivo on the top of the FreeNAS operating system where you can get it from the app store installed in a few clicks. This makes Nakivo the most flexible backup product when it comes to installation as the vendor has a large choice of installers for many OSs and NAS devices. You can download and test the Nakivo 8.5 Beta here. It's a public beta and if you install it in a test environment and do a few tasks they asking to do so, you'll receive an Amazon gift card. Let's have a look at all the details from the Beta page. Nakivo Backup And Replication 8.5 – What's New? Replication From Backup – decrease the use of system resources required for replication as no additional snapshots of the production VM are created. The whole process can be automated with Job Chaining where the backup job can trigger the replication job with a backup as the source. Once you launch a new replication job wizard and select VM backup as the source, NAKIVO Backup & Replication proceeds to read the data from the repository and inject it in the replica. Ransomware-Proof Mini Backup Appliance Based on Raspberry Pi – Nakivo can be installed on Raspberry Pi. 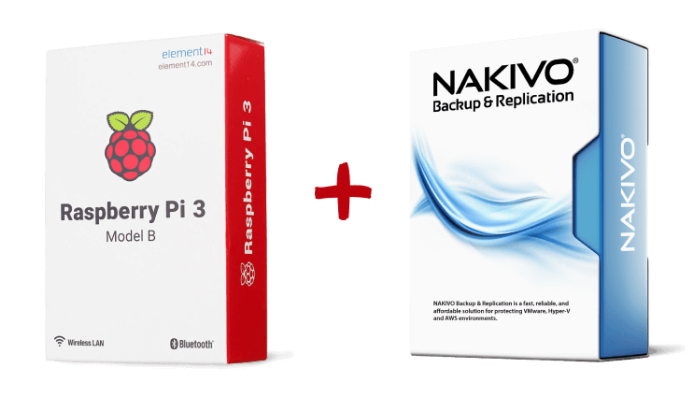 NAKIVO Backup & Replication is exceptionally light-weight, letting you install the solution on your Raspberry Pi device, creating a compact, cost-effective, and ransomware-proof backup appliance. Windows Server 2019 Support – NAKIVO Backup & Replication v8.5 Beta can be installed on Microsoft Windows Server 2019. Automated Update – Now there is a possibility to have Nakivo updates and patches installed almost automatically. You need just a few clicks where previously you had to go to Nakivo website to fetch the upgrade files. 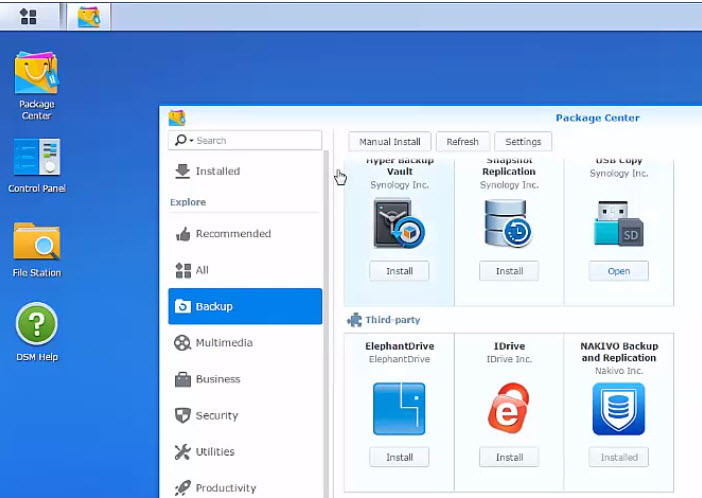 Nakivo can also be installed on certain popular NAS devices such as Synology. It runs natively on QNAP, Synology, ASUSTOR, Western Digital, and NETGEAR. Example of a Synology and their DSM management, with Nakivo as an app. Most of modern NAS comes with dual-core or quad-core CPUs so there should not be any performance hit for the NAS to perform some backup work on the top of the usual NAS work. The product also offers support for high-end deduplication appliances such as Dell/EMC Data Domain and NEC HYDRAstor. Advanced Site Recovery – You’ll be able to build a site recovery (via Site recovery jobs) to automate site recovery process. For example, a Site Recovery job can include any combination of the following steps: gracefully shut down source VMs, run a final VM replication, change replica VM IPs, connect replica VMs to appropriate networks, set the replica VM boot order, verify successful recovery, send email notifications, etc. Site Recovery Testing – Do tests of SR jobs and define recovery time objectives (RTOs) for recovery workflows and perform scheduled non-disruptive site recovery testing. The tests can verify whether site recovery can run successfully and whether the recovery process can be completed within the target time frame. Single-Click Site Recovery – you can do a planned failover, emergency failover, failback, and datacenter migration in a single click. You can create a single recovery workflow for an entire organization or create multiple workflows for individual departments, branch offices, etc. Advanced Bandwidth Throttling – you can now have a global rule for the whole environment, and (or ) also per-job limitations. You specify the amount of bandwidth used by data protection processes. Cross-Platform Recovery – Backup our VMware, Hyper-V or Amazon AWS VMs and chose the export format (VMDK, VHD, or VHDX). Automated VM Failover – With your replication jobs, you have an identical copy of your VMs with a data which differs only by the delta of what’s your RPO settings. If you let’s say replicate every 15 min, you lose at most 15 min of data. The VM failover job you’re able to specify which VM replicas should be powered on and create rules for network config (re-ip is necessary in most cases). So all VMs in the VM failover job is powered On at the DR site. You can download and test the Nakivo 8.5 Beta here.